Half an hour after applying sunblock, Aslan and I decided to explore a little bit of the resort. Hot day! It is important that you apply a lot of sunblock. Don't wanna get sunburn! I find it a bit puzzling why this part of the beach is brown and the one nearer the city is blue. Nevertheless, Shangri La Tanjung Aru is lovely. This is the building we are staying in... If Aslan's parents were to come along, they would have stayed in the suite with the balcony with their very own sun deck! What I love about this bar is the lazy chairs scattered around the corner. A very peaceful place for a pina colada with your loved one as you both watch the sunset. Since Aslan and I were still full from breakfast, we just wanted to relax there and enjoy the afternoon breeze. Doing what we do best, chillaxing! After a while, we got a little bored. Since the weather was perfect for a sun bathing session, we went to look for a more suitable spot. The lagoon area where one can enjoy swimming in the sea. Beside the lagoon is Coco Joe’s Bar and Grill. It is crazy to pay RM22 for a fresh young coconut. Extortion! Ah, frangipani/jasmine tree. I must have this tree planted at my own house in the future. Shangri La Tanjung Aru’s swimming pool is divided into three; toddlers splash pool, kiddies pool and finally, the swimmers pool. This is the swimmers pool, the deepest point is around 2 metre if I am not mistaken. The pool area was a bit too noisy, so we decided to look for a spot at the lagoon. Fortunately we found a nice spot under some coconut trees. The resort spa, CHI, is located nearby our sun bathing spot. This was the view we got when lying down on the deck chair. We dozed off for nearly two hours. We were in the sea when Aslan said his legs were prickly. Two good reasons why his legs were prickly; jellyfish sting or sun burn. Aslan didn’t bother with sunblock because he said his leg hair was thick enough to block out the sun. Man, that statement was a challenge to Mr Sun. You want to know why? Sunburned! Red as a lobster! When he pulled up his shorts, I laughed crazily. It was horrible! Poor thing was in pain for three days! Luckily they sell sunburn remedy at the resort shop. He found the aloe vera gel effective. We went back to the room to refresh ourselves a bit and reapplied sunblock. Dave was on his way with some sun tanning lotion and oil from the city. There you go, sunblock is VITAL during a beach vacation. While waiting for Dave to arrive, we decided to rest at the garden area. The sun was almost setting and such a waste to apply sunblock. I managed to persuade Aslan to buy himself a pair of Speedos at the resort shop, ideal for sunbathing without uneven tan. Dave arrived quite late due to some traffic jam in the city. We did not have time to swim, instead we watched the sunset. We spotted some crabs on the rock! We returned to the room and got ready for an early Italian dinner at Peppino. While waiting for the restaurant to open (We made a booking at 7pm), we wondered around the lobby. We were the earliest patron to have dinner at Peppino. I think I might have booked the whole restaurant. Hehehe. We ordered a few dishes to share between us. Caprisse: Buffalo mozzarella cheese and tomatoes salad. After dinner, we went to the executive lounge to have coffee, tea etc. Dave went overboard with all the cheeses and dessert. Back to the room around 9pm for an early night in because tomorrow will be a long day at the beach! P/S: Click here to make your reservation at this wonderful hotel! I must remind myself to avoid, if possible, 6am flight, even if I have the choice to travel business class. I barely sleep the night before and if it was not for the strong will to travel, I would have not awaken to catch the flight at all. Anyway, for a short taxi ride from 4 points by Sheraton to the airport at the wee hours of the morning (445am to be exact), it cost RM30. You do know the amount of things you can buy with that kind of money, don’t you? I found it completely ridiculous but then again, what other choice have I got? I told myself that there wouldn’t be anyone else keen to fly out at this hour but boy, I was so wrong. It was a full flight and thank God, Air Asia was on schedule. I won’t be one pretty girl once offended due to the unfortunate circumstances (i.e lack of sleep, betrayed as a result of stupid unmetered taxi charge, hungry, pms-ish). I will skip through the traveling part because nothing interesting happened. Aslan and I slept through the whole flight. Therefore, I will fast forward to the little piece of heaven I’d like to call Shang-ri La Tanjung Aru. We arrived at the hotel around 8am and checked in successfully very quickly. Since Aslan’s father is a member of the golden circle (Sounds a lot like a cult, don’t you think so? Hehe) we were upgraded to an executive suite at minimal charge. One bedroom suite! This is the living room area with a guest toilet too. My bed! Aslan and Dave bunked in the living room! The first agenda after the check in was breakfast! We were fortunate that we managed to have breakfast at Cafe Tatu. We arrived at Shangri La at 830am for goodness sake, luckily our room was available for early check in! I love the breakfast selection there! Many things to choose from and they are delicious! It is nicer to sit outside but make sure you get the side nearer to the beach front. Ah, breakfast was really good. I think I went overboard with the buffet selection. Before going out for some sun tanning session, we relaxed for a while. Let the food go down a bit. Stay tune for the second part of this installment! I don’t mean to sound melodramatic but raya is not the same anymore. Sighs. Put that sad reality aside for a bit, raya still means a lot to me. And to prove that point, I went back home to celebrate raya with my family. Yours truly in a kebaya. Even before Kate Middleton’s wedding, I always love lace. Match it with a nice Indonesian batik, a beautiful combination indeed. And of course, our first raya together. And well, believe it or not, my first raya with Sera too. Raya is bittersweet. May next year be better. Today’s itinerary was packed with full of activities and long bus rides! We woke up as early as 430am just to get ready as the tour operator fetched us at 655am. I was cold and dazed. I had 4 layers of clothing on me and yet, it was still freezing! We used Grayline tours and the bus for this particular tour was huge! It was a two story bus fitted with a small kitchen and even a toilet! Behind me is the stairs to go down to the kitchenette and toilet. More seats at the back. It was a wonderful experience, although at times I couldn’t help feeling claustrophobic as we went further into the cave. The walk to the boat ride to see the glow worms was pleasant, along the way, we some some rock formations, stalactites and stalagmites. It was also well lit and I think they’ve installed pavements and ladders to make the excursion more pleasant for the tourists. One of the chambers almost resembled a medieval church! I think the media managed to brainwash me thinking there would always be some monstrous or carnivorous man eating reptiles/animals in the jungle/sea/lake/river to the extent that I was afraid the boat might be overturned by some huge crocodile or some pre-historic reptile and eat us all. Same thing but instead of monsters, ghosts dragging us into the deep waters of the cave. Giant glow worms. Instead of bugs, they prey on humans. The cave collapses on us. Darn this imaginative brain. Luckily, none of the above happens and I survived the tour. The sight of the glow worms was definitely something but it didn’t look as impressive as the poster. What intrigued me was the method the tour guide navigated the boat in total darkness. I think he merely depended on some suspended cables to move the boat around in the cave area. Oh yea, the boat ride was done in pitch black. That explains why my brain was a bit too imaginative. I survived the Waitomo Glow Worms Cave. I didn’t get to explore the information centre or souvenir shop because of our tight tour schedule. Meh. From there, we continued to the Agrodome for some agricultural fun! This is the bus that we used today. Main highlight of this tour was farm life! And guess what we used to go around the farm? Tractor pulled carriage equals to farm safari! This is the tractor that pulls the carriage. Yours truly looking quite nervous/excited. Wonder what sort of farm animals waiting for me... Hehehe. As I said in my previous post, NZ is the land of bungees! God knows how many types of bungees they have here. It does not matter where or how, it is always possible to challenge yourself to bungee jumping. Most of the farm animals here are imported. I was surprised to see the Highland cows. The last place I saw them was in Scotland. Aslan looking very proud posing next to the Highland cows. When it was time to feed the animals, I kinda regret standing too close to the fence. The guide just gave me some pellets and well, I didn’t quite enjoy feeding the ostrich. Not exactly a farm girl. Close up of the sad looking ostrich. Drat, I must invest in a zoom lens. I thought that was all the feeding we would do but boy, was I wrong. I was telling my buddy to stay there and not bug me. So many of them, it was overwhelming. Again, I had to feed one sheep but it wasn’t as sloppy as the ostrich. Still, these she eps peed and pooped just about everywhere and anytime. They were lovable and yet so cheeky. Antelopes or deers, I am not sure. Honestly, I never seen a cow unclose before and I was amazed with their size. I was not too keen with llamas. They are known for spitting. I must admit though, this particular Llama looks really friendly. Once we did a tour of the farm, there was a demonstration of sheep dog. (I forgot the actual term for such activity). From watching the demonstration, a sheep may be docile but it can get quite cunning. The dog failed numerous times trying to get them in the cage. Hehe. Of course the tour won’t be complete without a sheep sheering demonstration. The guide said sheep sheering is like running in a marathon. It may look easy but it’s not. Next, we were brought to see how wool is made. A whole lot of combing, thanks to technology, this tedious task is made faster and in bulk. And no wonder wool is so expensive. Aslan and I spent 10 minutes looking around the store, checking out the souvenirs and well, we ended up buying some for our family and friends back home. Next destination was Rotorua and we knew we were there when we smelled rotten egg in the air. Still, it wasn’t that bad lah, a garbage site smells worse. We were brought to Rotorua’s very own cultural centre, Te Puia. We were told to choose a leader for a welcoming ceremony. Jo, Aslan’s brother did warn him that being a leader is a serious matter. The warrior came running out from the whare runanga, a communal and sacred place for the Maoris. I can never be serious enough and not laugh when the dude sticks his tongue out at me like this. Nevertheless, I think the welcoming ceremony was fantastic and the performance was brilliant! The songs and dances were lovely. These ladies have beautiful voices! This dance with the balls on strings represented a bird in flight. They also performed the Haka, the warrior dance. Sounds familiar? Well, New Zealand’s rugby team will always do the Haka dance before their game. A lot of stomping, chest thumping and tongue wagging involved here. After the ceremony was over, we went to check out the thermal mud and geysers. If you can pronounce the Maori name of this place, I respect you. Aslan and I did not stay long there since we wanted to check out the souvenir store. Later, we regret that decision because they also sell thermal mud products in the city. Meh. The drive back to Auckland city took 3 hours plus, along the way, we saw a truly beautiful sunset. Phew. Such a long day! The itinerary today was simple. Good food and good company. Teh Kah and her family brought us around Auckland. We even went to Northshore to visit their house. The day started with dinner at Faro, a South Korea BBQ Restaurant. I have to be honest with you, it was definitely a new experience for me. Squid in chili sauce: It was really tasty, chili sauce tasted a bit different, not sweet but sour. Mr Chin brought us here because he wanted us to try something different and unique. I was a bit reluctant at first but oh my God, I had such a wonderful time here and the food? Totally hit the spot! Mr Chin ordered plum wine which I never heard off until today. Mr Chin ordered a group BBQ set that comes with beef and a selection of starters. Beancurd Salad: A very healthy and delicious starter. Kimchi: Authentic and really spicy but it was good spicy... Hehehe. I'm not so sure what this is called but it was cold noodle with soy sauce. It was nice though. Sesame Leaves, good for ulam and to eat with green tea ice cream. Hehehe. More salad. I love the tomatoes, so fresh and juicy! Grilled prawn in butter garlic. We decided to try fresh cut sirloin and marinated sirloin. New Zealand beef... THE BEST, EVER! We were given complimentary green tea ice cream with sesame leaf. It was so good, I reckon it is better than Hagen Dazs! Faro Green Tea Ice Cream, I MISS YOU! We then walked off the food by visiting Albert Park. Since we didn’t have enough time to do a proper walk, we basically just checked out the entrance area. A lot of people dating here. I love the magnolia tree, the one with pink flowers. So beautiful. We stopped briefly outside Ada’s university to drop off some bulbs for her theater performance later on at night. Ada is Teh Kah’s sister. We also went to Auckland’s fish market situated at the Viaduct Basin near the harbor. Aslan posing with his favourite fish: Tarahiki. The fish market is very clean and I love the way they display and store the fishes and other sea creatures. On our way back, we crossed the Harbor Bridge and the view of the city at night was amazing! I am in love with Auckland. More stories soon! Today was a day full of boat rides and amazing sceneries. The first boat ride was a cruise around Auckland Harbor and the nearby islands. One thing I love about Auckland Harbor is its cleanliness. Although there are thousands of boats in the area, the water is still very clean and wonderfully turquoise. Fullers is the name of the cruise company, this is the smaller version of the ship we used today. After going around the harbor and surrounding areas which included Paritai Drive, Mission Bay just to name a few, we stopped at Rangitoto Island to drop off some tourists. We had the opportunity to explore a bit of the island. I must say, it was a wee taste of Hawaii! On the island, there is a dormant volcano with the same name. Before going onto the island, we were warned to check our shoes for any dirt and bags if there are any rodents or foreign insects that could damage the natural ecosystem of the island. On the jetty, this photo looks so wrong. I ought to be wearing beach wear instead of this coat and boots. Meh. Rangitoto is absolutely beautiful! The water is blue and crystal clear, I was tempted to jump in! The island itself is a result of volcanic activities throughout the years. I can't wait for my honeymoon. Hawaii, come to mama! If you are in Auckland, do visit Rangitoto Island! We then continued passed Rangitoto to go see the Harbor Bridge. It connects North Shore to the main island. Yes, they do bungy jumping here. I think New Zealand is the place to go for bungy jumping, they’re everywhere and in so many varieties! Auckland Hilton has a suspended pool and very nice view of the sky tower. After the cruise, we took a short boat ride to Devonport. We spent the day walking around and taking photos. We went to North Head and Mount Victoria. You can never separate me from my BB. A lot of speciality shops and nice restaurants here. Checking the water temperature and it was freezing cold! We took the tour service to go to North Head and Mount Victoria as well as a drive through of Devonport. It was really interesting but unfortunately, the only photos I have are the ones taken at the extinct volcanoes. 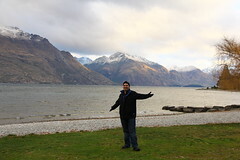 I am in love with New Zealand. Such a beautiful place, friendly people, good food; in short, a fantastic country. North Head used to be an military fort, there are secret tunnels and batteries on both sides of the mountain. See that hole thing on the left? That used to be the spot where the battery was. When I said battery, this is it but smaller. I bet those houses below are expensive! What a view! Mount Victoria is no different than North Head. It also used to be a fort. Busy port and yet the water is still clean! I woke up as early as 8am today. Initially, we planned to do the hop on hop off and Sky Tower. As usual, things did not go as planned. We ended up exploring the city center and the area that surrounds it. We walked from the hotel all the way to the waterfront area. It took us less than half an hour to do so. It was a nice walk although nothing much to see on Hobson Street. See that orange shop at the corner? Well, that is one of the many Asian grocers here on Hobson St.
Sky City and Sky Tower, about 10 minutes walk from the hotel. The reason why we cancelled going to Sky Tower today was because of the weather, it was a bit misty. Our friend living here suggested we go for the dinner package at 5pm, that way we get to have dinner in a rotating restaurant apart from experiencing the Sky Tower. We went to the waterfront because we thought of getting the day pass for the hop on hop off at the Ferry Building. Before that, we checked out the Viaduct Harbour. This huge yacht was the first object that greeted us when we arrived at the waterfront. How I was dressed today. There is an afternoon tea or dinner cruise on this yacht but really pricey, at least NZD89 per person! Some of the tour boats at the harbor. How a yacht looks like on land! Huge keel! 18 days to the Rugby World Cup and we can already feel the heat! Aslan looking very happy here. The building at the end is Hilton Hotel, designed exactly like a ship! While we were in the area, we booked seats for tomorrow’s cruise around Auckland. The same package also gives us free return tickets to Devonport, which we will visit after the cruise! You know what’s coming towards you tomorrow. We waited for the bus for 15 minutes before realizing it might not stop over here. We gave up and went to book seats for the day trip to Rotorua and Waitomo Caves. Up ahead is one of the popular shopping street, Queen Street! They are so excited for the Rugby World Cup, they have a countdown timer for it! We used this bus to get to the city from the airport yesterday. From the plane, Auckland looks really flat but it is not! Quite hilly actually. While waiting for our friend, Teh Kah, to fetch us, we decided to take a look at the shops. The shops are okay but nothing too interesting. Honestly, wrong place to go for a shopaholic. BUT I must insist the price of luxury brands are quite cheap here. Not that I have the money to splurge though… Cuci mata jer. DFS Galleria Customhouse where they have LV, Dior, Celine, Gucci and Burberry to name a few. 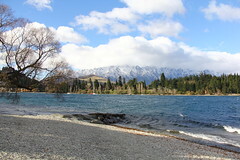 Teh Kah brought us to Mission Bay, situated just 15 minutes drive from the city. It is such a beautiful place and I was really tempted to jump into the sea, even if the water was freezing cold! Lovely day for an outing at the beach. A lot of seagulls here, very tame. But I still don’t like them, I think they’re quite pesky. When they flew over me, I kept on chanting, “Don’t you dare poop on me!” Hehehe. Phobic. This bird looks cheeky, perhaps planning something dubious. Teh Kah then brought us to Paritai Drive which has a lot of expensive properties. Among the view they get from living here? A lot of boats and this is just one of the many marinas available here! Next, we went to New Market where we stopped briefly at a Ferrari and Masserati showroom. As for dinner, we had seafood at Fish Pot Cafe. A lot of food just for three people! Flash does really make it look really bright outside. =.="
L&P, New Zealand's famous drink. Definitely will come back here next time, truly enjoyed the meals! Anyway, I hope you’ve enjoyed today’s entry. That’s all from me! Kia Ora, I am now in Auckland after 10 grueling hours on Jetstar. I absolutely love their custom officers, really friendly! We got through immigration fine. I’ve got just a few photos of today. Not many photos of the city just yet, that one you have to wait. It was nice to see daylight! Overall, as I blogged yesterday, the flight was as expected. I got exactly what I paid for. How we looked like after 8 hours on the plane. Obviously, not much sleep. It took us about half an hour to get through immigration check and baggage retrieval. Auckland airport is really simple but nicely decorated. Sorry no photos as we were so excited to see Auckland, we forgot about photos! On the Air Bus to the city. We used Air Bus to save some money. It cost NZD 32 for two people while taxi would set us back as much as NZD60! We were dropped off at Queen Street, just about 10 minutes walk from the hotel. Luckily we managed to locate it easily. The hotel of our choice is Auckland City Oaks Apartment Hotel on Hobson St. Our room is really compact and caters well to our basic needs. For 7 nights stay, it cost us NZD730, quite a steal! The first bedroom, my room. The second bedroom looks exactly the same. A good deal, don’t you think so? Really convenient to have kitchen and laundry! Anyway, after settling in, we decided to explore the city a bit and have lunch. I know it is the fasting month but since we were traveling on the plane, not so sure when to sahur. No photos of the city since we decided to do that later, maybe tomorrow. In the end, we opted for Wendy’s. Worst decision ever. It was mediocre. Disappointing lunch. Maybe God's way of telling us to fast! Hehehe. Aslan said he prefers Burger King over Wendy’s. I thought to myself, should have gone for the kebab. Meh. Oh well, maybe next time. Too tired from the travel, we went back to the hotel and settled in for the day quite early. Promise to blog more with photos tomorrow! I woke up quite early today. Two flights to catch. First of all, to Singapore via Air Asia. There was a lot of people at the airport, all keen to go to KL or balk kampung. While waiting for the plane... Pointless photo. Did you know that from September 21, if you don’t do web check-in, Air Asia will charge RM10 per person at the check in counter. Probably to cut down cost but it is a bold move, pray that their ground staffs be kind to us. We waited for 20 minutes before boarding the plane. Aslan and I were the only guests sitting at the hot spot area. The night before, we did not get enough sleep as we were busy cleaning our respective houses. I decided to vacuum my room, clean the bathroom and in my usual last minute style, packed my bag. Tired faces. The flight was smooth and my friend, Adam, co-piloted the flight! Once we landed in Singapore Changi Terminal 1, he actually went out from the cockpit to see us. Thank you, Adam, for getting us into Singapore safe and sound. We took a cab to Fairmont where we met up with Aslan’s parents. In the cab: I always have a big smile on my face when in Singapore, I just love the city very much! Fairmont is like a home away from home. We went to Raffles City to buy a few things. Aslan needed a jumper and a warm jacket. You will find out why later on. We left Fairmont at 5pm and checked in for our next flight at Terminal 1 Changi Airport. Aslan and I posing with the plane... Hehehe. Since it was a 10 hours flight, we paid for extra legroom. Nowadays, it is vital to spend a bit more in order to have a bit more of comfort. Sad truth. Lots and lots of leg room! 2-4-2 seat configuration also means Aslan and I got to have a date on the plane, no third wheel. Hehehe. Jetstar’s seats and airline staffs are awesome. Although I must be frank I was not happy with the price of the meal and how I had to pay for them. One bottle of mineral water and a small packet of cheese and biscuit cost me AUD7.40 and you know what that means? I will get charged more since I paid using debit card. Boohoo. Aslan and I did not bother with anymore food or drink since then. Aslan slept through most of the flight. Lucky him, I didn’t get to sleep that well. But before that, we filled in the immigration form. It was like answering an exam paper. Specifically, the city of sails, Auckland. Stay tune for the next entry!